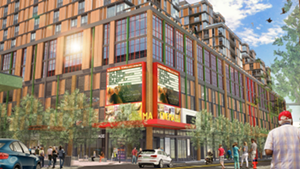 Members of the Coalition for a Livable City spoke against the mall redevelopment plan. 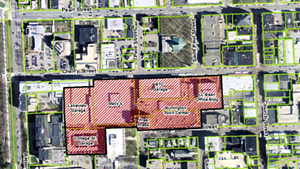 A proposed ordinance that would change Burlington zoning to allow 14-story buildings to be constructed in a section of downtown is now in the hands of city councilors. Planning Commission members voted Wednesday to send the measure on to councilors, who must ultimately decide whether to approve the ordinance and allow 160-foot-tall structures. 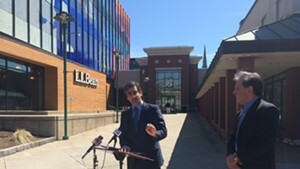 The change is being considered to help enable redevelopment of Burlington Town Center, a project proposed by the mall's owner, New York developer Don Sinex. 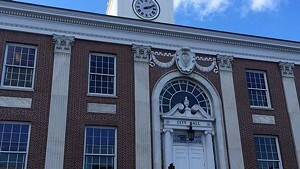 The unanimous vote of the four members in attendance came after a marathon public hearing at Burlington City Hall that went on for three hours as more than 40 people made their voices heard. Most spoke against the zoning change, which would allow for taller buildings in an area bordered by Cherry and Bank streets. 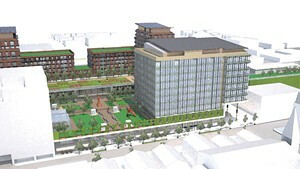 Sinex, who has proposed redeveloping the suburban-type mall that dates to the 1970s, wants to build a mixed-use residential, office and retail complex that could include three buildings topping out at 160 feet, or 14 stories. 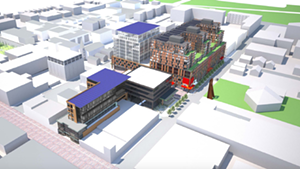 The $200 million project would also reconnect portions of Pine Street and St. Paul Street, which were segmented when the mall was built. Only four members of the Planning Commission — Yves Bradley, Bruce Baker, Emily Lee and Jennifer Wallace-Brodeur — were in attendance and voted. Lee Buffinton recused herself early in the process after a representative from her employer, Champlain Housing Trust, spoke out in favor of the zoning change and redevelopment proposal. Many of those supporting the changes spoke of the increase in city housing stock, the jobs and the vibrancy that such a new development could bring to the city. Several wore pins reading "Say Yes." Jason Robinson, owner of LeZot Camera, spoke of losing talented, trained employees to other cities more affordable and welcoming to a young workforce. "I employ eight people — I'd like to keep them," he told the commission. "My people are my currency: I train them and I trust them. I want to be able to go home at night, and when they leave [Burlington], I can't do that. I support this project and whatever you have to do to get it done." Others argued that the new construction would only drive more people away by pricing them out of the city. Many speaking against the project painted Sinex as an outsider hoping to capitalize on the plan. They also said the process was rushed, as the zoning changes must be approved by September. "This sets a dangerous precedent: Anyone can come in and buy zoning now," said Alex Lavin. "Changing the zoning to please the developer defeats the purpose of zoning," added resident Jack Daggitt. "It's like the tail wagging the dog." 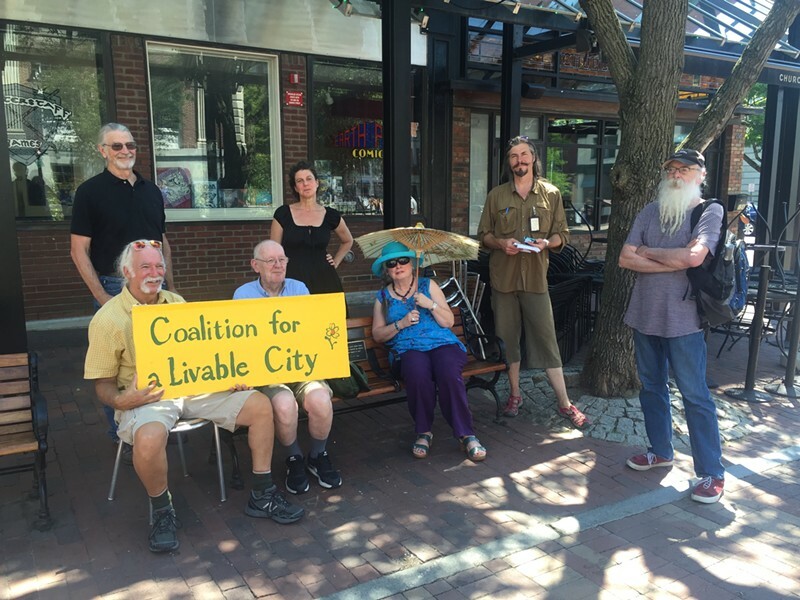 Earlier Wednesday, a group called the Coalition for a Livable City spoke out against the plan during a press conference outside city hall.